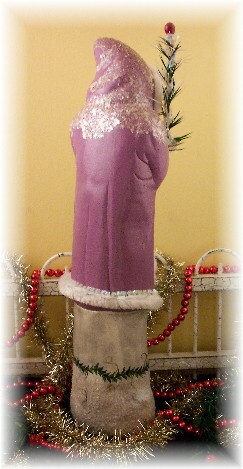 Belsnickle's robe is painted antique white adorned with berry tipped feather trees all the way around. He wears a pine garland is painted across his shoulders draping down his arms. His hood is burgundy double trimmed in an old green and burgundy chenille. 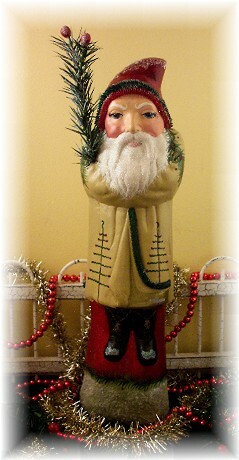 He stands on a burgundy base and sage base trimmed in a pine garland. 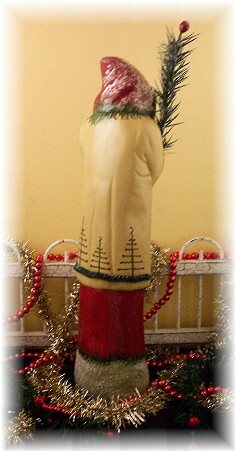 A real, double goose feather tree is carried in the crook of Belsnickle's arm. This big guy will make a perfect addition to your collection or as a gift to an avid Belsnickle collector...any time of the year, not just Christmas. Holly Belsnickle is painted a snow white adorned with holly leaves and red berries. 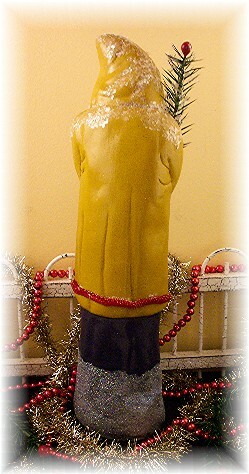 The front of his robe is trimmed in a wonderful old gold trimmed in a green chenille. His hood is trimmed with a deep burgundy chenille. He stands on a burgundy snow covered stump. Belsnickle carries a green and white goose feather stem in his arm. A goose feather wreath hangs from his waist. Aged to look old from the beginning, he will surely become one of your favorites! This gold Belsnickle is just beautiful! His is painted with a wonderful old gold color and is wearing a burgundy gown underneath. His hood and robe are double trimmed in old gold and burgundy chenille. A pine garland dotted with red berries drape from his front of his robe down the back onto the black base. He carries two goose feather tree branches topped off with burgundy berries. Fine mica and gives him a snowy look. He's sure to become a favorite family heirloom. This sage Belsnickle looks old from the start. He is painted in a historically correct color scheme. His sage robe is trimmed in mustard. Beneath his robe he wears a burgundy gown. His hood is double trimmed in an aged beige chenille and metalic gold trim. He stands on an antique white base glazed in old gold. A trim of burgundy stars connected with a gold 'chain' go all the way around the base. He is wearing his favorite 'fur' trimmed black boots. 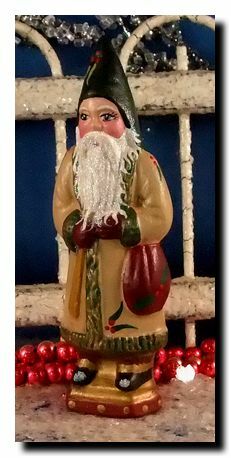 Belsnickle is a great old looking chalkware collectible, a wonderful addition to your folk art collection. In the antique world, if a violet Belsnickle is found, it is a very rare find and wonderful prize for the collector. This Belsnickle is just perfect, painted historical colors. He is trimmed in a long white chenille as well as an irredecent trim. His gown is has a vine and berry trimming. A pine garland circles the white, snow covered base. 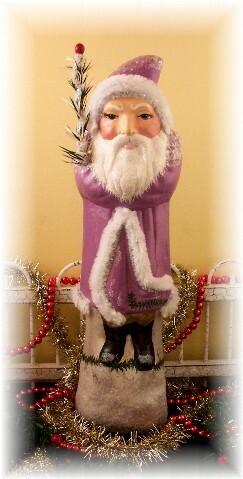 He is simply a perfect and unusual addition for your Belsnickle collection. 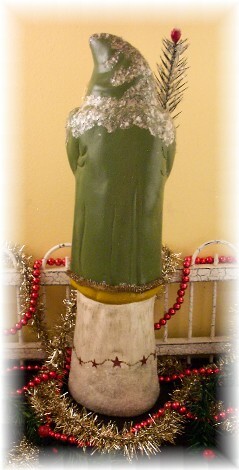 This big guy is just the perfect Belsnickle for your county home. He holds a rusty star trimmed goose feather stem in the bend of his arm. On his back is a braided rope belt from which three rusty stars hang. Painted feather trees surround the bottom of his robe. This big guy will make an impressive collectible. He is painted in historically correct colors and trim, black robe with gold tinsel trims, and hood double trimmed in ivory and gold tinsel. His robe is accented with a bit of gold sponged over his shoulders and arms. 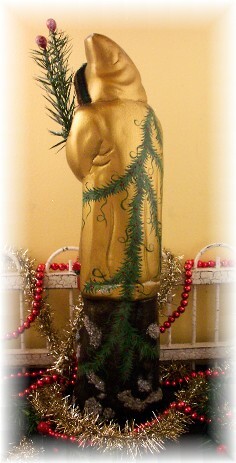 The base he stands on is painted green with gold stippling then covered in very fine glitter. Finished in a crackle finish makes him look antique from the beginning. 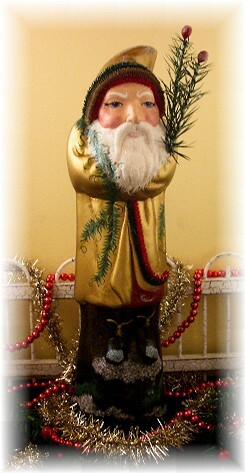 Painted and detailed historically correct, this German Belsnickle is painted an aged, crackled, mustard. His blue gown just shows in the front where his coat is blown back by the wind. Burgundy chenille finishes off his hood and robe. 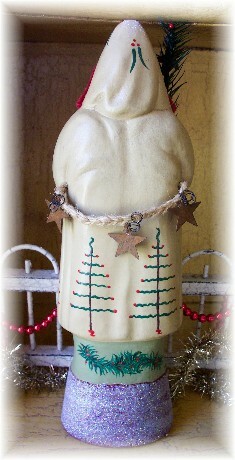 Antique mica gives his hood and shoulders a snowy, frosty effect. Painted true to historical colors and detailing, this Belsnickle will become a treasured addition to your collection. He is wearing a deep burgundy robe and is standing on a pine garland trimmed antique white base. Gold tinsel trim around his hood and robe. Antique mica has been added to his hood, shoulders, and arms for a cold, snowy look. The base is covered in very, very fine mica.Crackle finish, aged, then sealed several time to preserve him for generations to come. Those magnificent Belsnickles! Standing so stoic, a bit bent over with his hands tucked into his sleeves. His trimmed hood frames a wonderful face. The 'fur' trimmed robe is belted in the back. He has on his best black boots trimmed in gold 'fur'. Sure to be a hit for that Belsnickle lover on your list! This Belsnickle has it all....a switch in one hand and toy bag under the other arm. So true to the history of Belsnickle, the switch to rake on the window of a home to scare the children, a bag carrying treats for the children of the house. A wonderful collectible to give of add to your own collection. He looks tired and worn out from all the years of being Belsnickle! He's about ready to make his rounds sneaking around during a nice gentle snowfall and a few snowflakes have stuck here and there on his robe. Just a perfect ole guy to give as a gift and don't forget to add yourself to your list. This is a little guy with a sweet little attitude. He stands tall and proud. Tinsel trim frames his sweet little face. His prominent beard hangs over his cuffed arms. He's happy to carry the pine branch in the bend of his arm. Made of chalkware from an antique chocolate mold. He is individually hand-poured, painted and detailed. A small amount of very, very fine mica adds to his magical look. Cute as can be...this little guy will make a perfect addition to your collection or a cherished gift to that collector on your Christmas list. 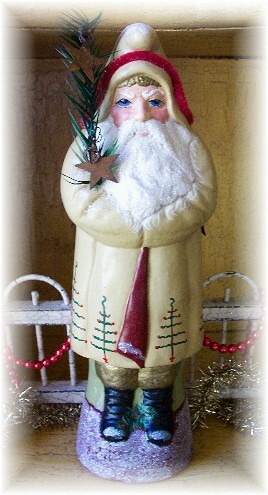 He is made of chalkware from an antique chocolate mold. Hand-painted and detailed with swishes and berry dots. Aged with a crackle finish, the sealed for preservation. Very fine mica adds to his frosty look.